Ova opcija neće raditi kako treba. Vaš pretraživač na žalost ne podržava okvire. Kupite karte online i preuzmite ih pre početka predstave! "White Button" were a band with the effect of the Beatles in former Yugoslavia, and this documentary charts their life through that troubled era. 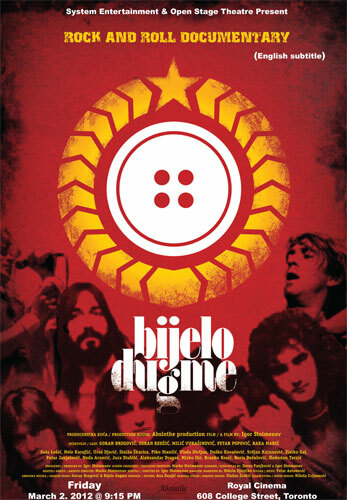 White Button, or Bijelo Digme, might not be a name familiar to audiences on this side of Europe or across the pond, but from the early 1970's up until the end of the 1980's they were the most popular and influential band throughout the various territories that comprised Yugoslavia. Hailing from the Bosnian capital of Sarejevo, White Button could be seen as an Eastern European version of The Beatles in terms of their popularity and ability to create mass hysteria wherever they played. Essentially a conglomerate of different Western Rock'n'Roll bands of that period, from Led Zeppelin, through T-Rex, to The Rolling Stones, they paved the way for an entire music scene. They also imported the outrageous decadence of that culture which was somewhat at odds with the 'Socialist Youth' of Yugoslavia. The documentary provides an interesting political context to White Button’s career; the band started as the new constitution was formed in Belgrade under dictator Tito, and broke up in 1989, just a year before the state disintegrated. We see how the band influenced the politics of the time, with front-man Goran Brejovic, a champion of multiculturalism, keen to promote unity through his music in an ethnically mixed and politically volatile country. This fascinating documentary, made up of interviews with the band members, as well as photographs and footage from the band’s peak, sheds light onto an under documented and little known musical phenomenon as locally powerful as anything England of America has seen.